This trip was a multi-stop swing through Alabama and Texas, with stops in Rainsville/Fort Payne AL and Houston TX; Monday November 14th through Friday November 18th. Not much to note here; check-in at the Delta kiosk was uneventful as was the trip through security. I had my roll-aboard and messenger bag, so I didn’t have any luggage to check with the airline. Syracuse NY (SYR) to Atlanta GA (ATL) on Delta flight 2156 – MD 90, 793 miles. A full flight in seat 37E, a window seat next to the right engine. Aircraft with engines mounted to the body of the aircraft, such as the McDonald Douglas DC-9 series of passenger planes, tend to have higher cabin noise than aircraft with the engines mounted on the wings. This was no exception. Sitting in the last three or four rows of a DC-9/MD-80/MD-90 series jet generally means that announcements are unintelligible over the engine noise. 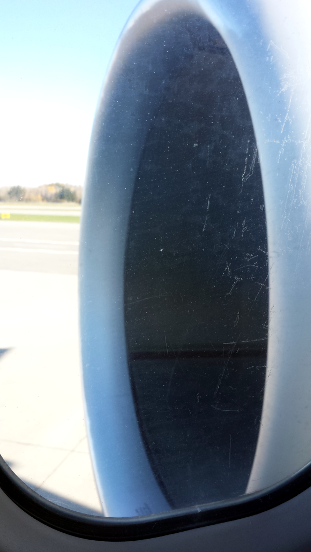 The photo also highlights a minor pet peeve of mine…why are airplane windows always so scratched up? I’ve never seen someone on a flight pull out something sharp to clean their window with, so I’m not sure why so many of them seem to have been subjected to cleaning with a set of ginsu knives. Otherwise the flight was uneventful and relatively smooth. As we started our descent in to Atlanta, the pilot mentioned that there was reduced visibility due to “smoke”, and a few of my fellow passengers and I exchanged puzzled looks over this. Turns out that due to the extreme drought in the South East US, there are numerous wildfires which are causing haze, reduced visibility and respiratory problems (more on this later). Atlanta GA (ATL) to Chattanooga TN (CHA) on Delta flight 5144 – Canadair Regional Jet 200, 106 miles, seat 14A. Delta flight 5144 is listed as 55 minutes, but the actual flight time is only 21 minutes. The pilot didn’t tell us was our cursing altitude was, but I’d guess that is was no more than 10,000 feet. Other that the thick haze from all of forest fires, this was truely a mundane flight. The Chattanooga Regional Airport is a small airport just outside Chattanooga TN. It’s either a new facility or newly remodeled, and the entire facility had lots of polished surfaces and a modern look. The main hall has a domed ceiling with a skylight. It’s small with only 5 gates, but the gate areas were very large and conformable. Free high speed WiFi was available throughout the entire facility. CHA is currently serviced by American, Delta, United and Allegiant with daily flights to Chicago, Detroit, Newark, Washington DC, Charlotte, NC, Atlanta, Dallas, and seasonal flight to Orlando via Allegiant. While I was there in mid November, the airport was decked out for Christmas including Christmas music playing all day (see photos below). This airport doesn’t have a TSA precheck line through security, but if you have precheck status, they will give you an orange card to carry through security which allowes you to leave your shoes and jacket on. You still have to remove your laptop and liquids from your carry-on. The rental car lot is right outside the baggage claim area and the rental agency desks are in the general baggage claim area. Due to the small size of the airport, there is no Emerald Isle or other drive and go options. Everyone needs to pick their keys up from the respective rental agency counter. Some shots of the CHA airport. While I was there, the Christmas decorations had just gone up. After picking-up my rental car, I made the 50 minute drive from Chattanooga Tennessee to my hotel in Fort Payne Alabama. The scenery was nice as you made your way through the mountains, but in places you got a strong whiff of the smoke from the many forest fires in the region, but it was an otherwise uneventful trip. 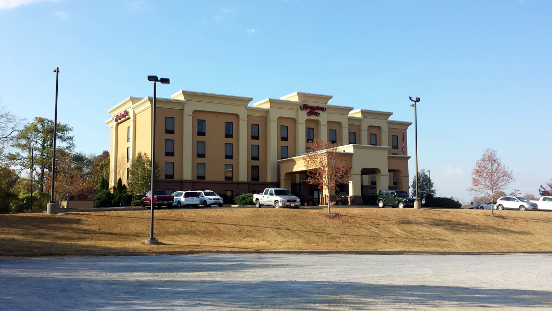 This was a pretty typical Hampton Inn, clean and relatively modern although a little short on amenities. I had a room with two queen beds which was on the large side. The room was clean and came with a microwave/refrigerator cabinet and a single serve coffee machine in the bathroom. 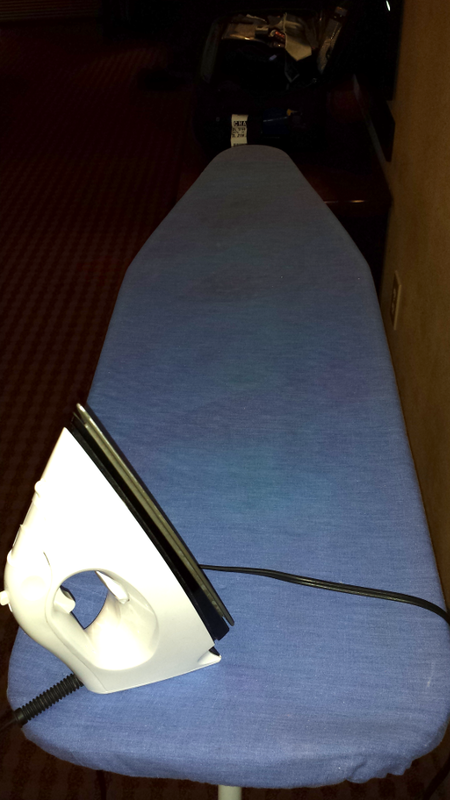 For the second time in two weeks I had a room where the previous guests had attempted to use the iron without having a clue how to iron their clothes as the ironing board pad was scorched in multiple places. Just a note folks, don’t leave the iron facing down, and if you smell smoke, you may have the temperature turned up too high. The hotel provides a complementary buffet type continental breakfast. Coffee, powdered eggs, sausages, oatmeal, fruit from a can. They had a hot waffle iron for those interested in making waffles. It was okay, but nothing to write home about. The breakfast area is open from 6:00 am to 10:00 am, and does not serve lunch or dinner. The hotel also don’t encourage using the area as common space, as they turn out the lights in this space in the evenings. The business center consisted of a small room with a couple of computers and a laser printer; very bare bones. Each room has both an RJ45 jack for wired internet access (bring your own cord) and wireless available throughout the hotel. Whenever wired is available, that’s what I use. As with other Hilton properties, you need to sign-in on your browser to enable internet access. Internet access is free, with higher data rates are available for an additional charge. I don’t mean to single out this particular hotel, and I’m sure management means well, but many hotels that put up placards and signs about being green don’t seem to be doing a very good job. 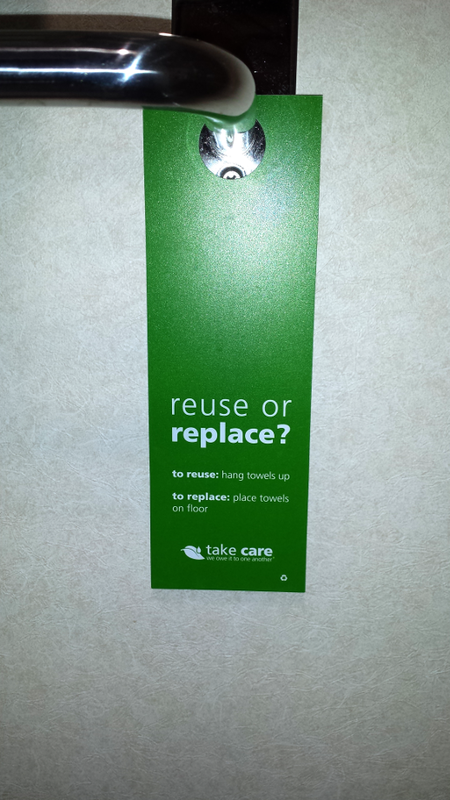 In this particular case, which was by no means unique, there is a sign in the bathroom that says if you want to reuse a towel, hang it up, otherwise leave it on the floor and it will be replaced. I neatly hung-up the towels I used in the morning, but when I got back to my room in the evening, all of the bathroom linens had been replaced. I’m not sure if the people providing housekeeping are aware of the re-use policy or if they’ve been told to just replace everything. It’s something I need to send the hotel a note about. On Tuesday morning the hotel was having some hot water issues. Although my shower was initially warm, several times the water went cold and was very slow to warm back up again. I likewise had trouble getting any hot water out of the sink. I’m not sure if there was a problem with the hot water system or if there were just too many people using the hotel utilities at the same time, but Wednesday morning there seemed to be plenty of hot water. In the end any of the issues I’ve pointed out are not deal breakers; I’d stay at this hotel again without a second thought. My ultimate destination for the first leg of the trip was Fort Payne Alabama, and after making the trip, I started to think about whether flying to Chatanooga and driving was faster or slower than just getting a rental car and driving to Fort Payne from Atlanta. I pulled up Google Maps, and at the time, the best case scenario was a 2 1/2 hour drive, not including time to pick-up the rental car, and the traffic around Atlanta, which rivals that of Los Angeles. Throw in an accident or two, and I’m guessing that the drive could easily hit three to three and a half hours. Although the flight from Atlanta to Chattanooga is only 22 minutes, factoring in taxiing at each airport, the layover between flights, picking up any baggage, and becomes a toss-up as to how to get to Fort Payne once you’re in Atlanta. You can make the 22 minute flight to the Chattanooga airport and then drive drive 50 minutes to Fort Payne or, you could drive straight from the Atlanta airport to Fort Payne, the fastest route being a 2 and a half hour drive. Strictly by the numbers, and depending on how long your layover in Atlanta is, driving from Atlanta is probably faster, but I wouldn’t say it’s a guarantee. Fort Payne is a fairly small community (population 14,000), and restaurant choices were fairly limited. The closest brewpub was over an hour away back in Georgia, and even the closest Panera was 45 minutes away. 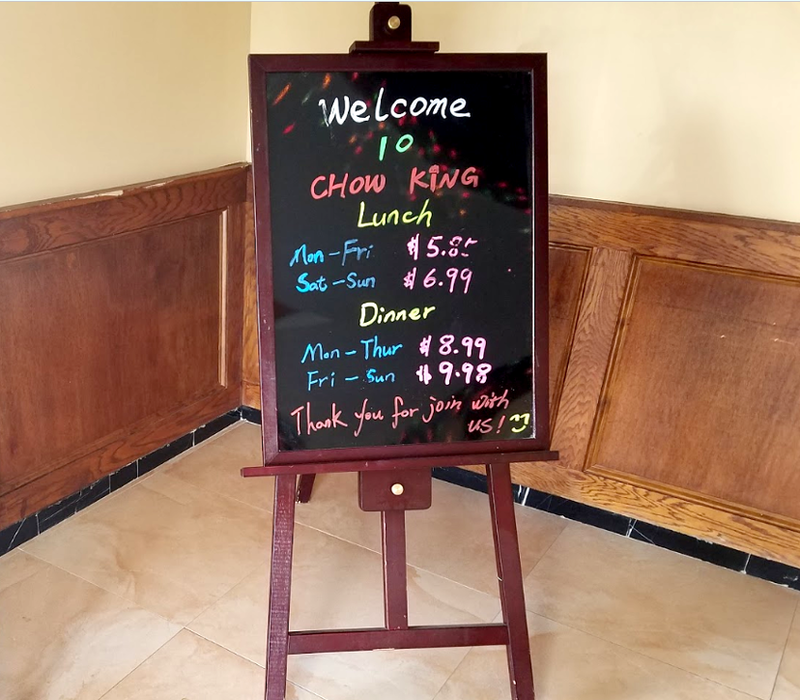 Checking options, just down the street from the hotel was a Chinese restaurant, Chow King (1509 Glenn Blvd SW, Fort Payne, AL 35968). It was within walking distance of the hotel, so I decided to give it a try. I would best describe this restaurant as Chinese meets Southern cooking. I’m no stranger to Chinese food in Central New York, but this style of Chinese cooking was entirely new to me. Where I would otherwise expect lots of tofu and noodles, there were instead, hush-puppies and macaroni and cheese. There was also an entire buffet devoted to desert. As a vegetarian I found the selection a little more limited than I was used to in Chinese restaurants back home, but I didn’t go hungry. As I was being seated, the waitress asked if I would like tea, “yes, please”, and being in a Chinese restaurant I was expecting a pot of hot black tea. Instead my waitress delivered what looked like a glass of iced tea. Regarding iced tea, and given the choice, I normally order unsweetened tea, but it isn’t as if I’ve never had sweetened tea before. 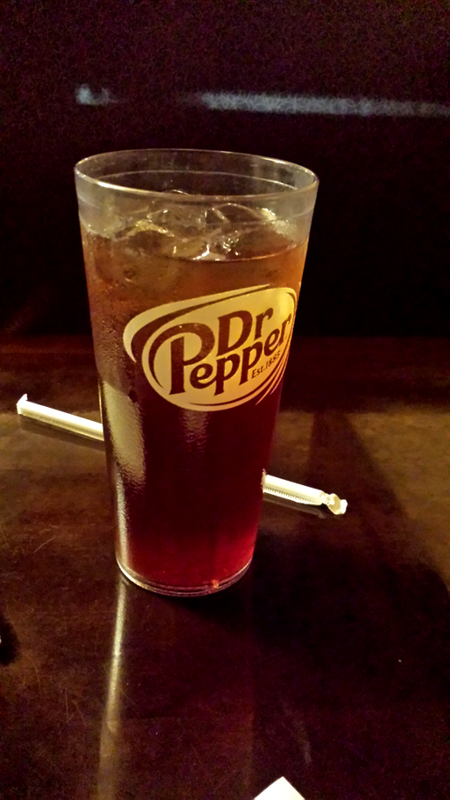 Taking a sip from the cup in front of me, I found an entirely new species of tea; southern sweet tea. To say that this is a sweet beverage doesn’t come close to doing it justice; it would be like saying the surface of the sun is hot. This drink has an intensity of sweetness like nothing else I’ve ever had before, where the flavor from the tea leaves runs a distant second to the intensity of the sweetness. I haven’t looked up how it’s made, but my guess is that you start with hot tea, add as much sugar as you can to create a supersaturated solution, and then chill it down. As for me, I was only able to a couple sips of this Southern treat; it literally made my teeth hurt. 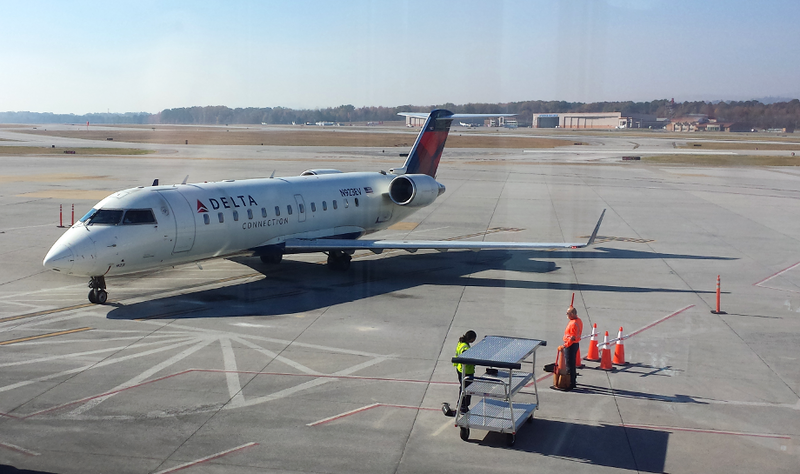 Chattanooga TN (CHA) to Atlanta GA (ATL): Delta flight 5490 –Canadair Regional Jet 200, 106 miles, seat 5A. This may have been the exact same jet I flew on up to Chattanooga on Monday; I got the feeling that it spends the day flying back and fourth to Atlanta. A full flight back to Atlanta, which was otherwise uneventful. Flight time clocked in at 25 minutes. Some shots from the air (note that they’re hazy from the forest fires). 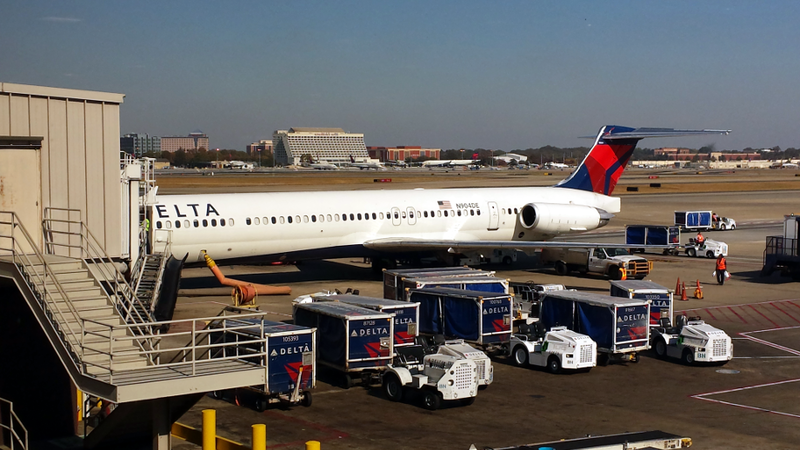 Atlanta GA (ATL) to Houston TX (IAH) on Delta flight 1489 – MD-88, 687 miles, seat 34A. Delta 1489 is an hour and a half flight to Houston. Our flight was delayed three times and ended up leaving an hour late, but I was just heading to my hotel once I reached Houston so I didn’t have anything that was time critical. I always have either something to read with me or work to do. Unlike most of my flight these days which are filled to capacity, this flight was about 2/3 full, so there was plenty of space in the overhead compartments for everyone’s gear. Other than a few bumps right after taking off, it was a smooth flight. 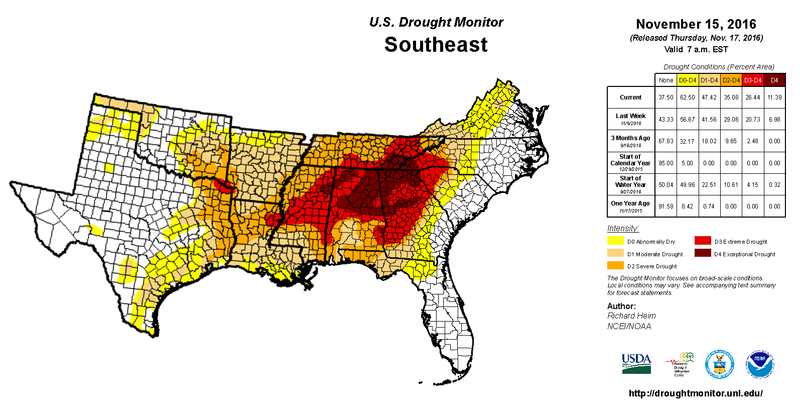 For those that don’t know, in 2016 much of the United States is experiencing mild to extreme drought conditions, with California and the South East with the most extreme and widespread drought (see graphic below). As a result of tinder dry forests, a large number of forest fires are currently burning across the Appalachian Mountains, caused by both natural sources such as lightning and humans being careless with camp fires. Although I had heard of the fires via short news stories on various media, my first real world experience was on the flight from Syracuse to Atlanta when during the descent the pilot came on to tell us the weather conditions and mentioned that visibility was down to only a mile due to smoke. Looking out the window, there was definitely a thick haze blanketing the region that at first I thought was just cloud. Deplaning for my next flight there was just a slight aroma of camp fire, but just barely. The haze/smoke blanket was visible from the flight all the way Chattanooga, and the camp fire aroma was much stronger. On the drive to and from Fort Payne, there were a few valleys where the smoke was so thick that visibility was significantly reduced, you had to clear your throat more than a few times to get rid of the soot feeling. As of November 19th, 2016, the region had gone 28 days without rainfall, which at the moment ranks as the 7th longest stretch without rain in the city’s history, the longest being 35 days. I also didn’t immediately put two and two together, but Tuesday and Wednesday morning I woke up with my allergies going haywire…swollen eyes and very stuffy. Nothing an allergy pill couldn’t handle, but the local news was reporting that there had been a huge surge in residents visiting local hospitals with respiratory problems, and in some cases officials were advising people to stay indoors. Forest fire West of Atlanta GA.
Forest fire North of Atlanta GA.